Cornwall's Eden Project has unveiled designs for a £12m education centre. Designers say plans for the new centre have been inspired by spiral patterns found in plant life. The building will house information about plant life, exhibitions, workshops and events. Work is to start on the new building in early 2004, subject to planning permission from the local authority. It is due for completion by the end of 2005. 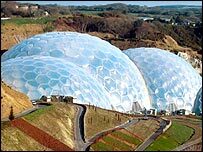 The new centre will stand alongside the Eden Project's plant-filled biomes - large greenhouse domes, on the site of a former china clay pit near St Austell. Structured like a tree, the new centre will have a huge canopy letting in light through the roof. Jolyon Brewis, who is leading the project, said: "We decided the structure of the building itself should be derived from the double spiral and we looked at the mathematics behind these spirals in nature to generate the design." However, the project's chief executive, Tim Smit, has said he hopes the new development will not bring in more visitors but enhance their experience. He said: "On busy days it feels like you're packed in here like sardines. "What we want is for people to be here and relax so that they don't feel they are going round in a mob. "I'm not actually interested in attracting more visitors. I want the levels to stay the same. "More visitors isn't more interesting. I want people who have come here to have had a fantastic time and to leave here having had a chance to reflect on major things and take away memories that will stay with them." The principles behind the new design follow the Fibonacci mathematical sequence discovered by Leonardo da Pisa in the 13th Century and echo the spirals at the centre of a sunflower or pine cone. The new centre has been funded with a £10m grant from the Millennium Commission, together with £2.89m from the South West Regional Development Agency.